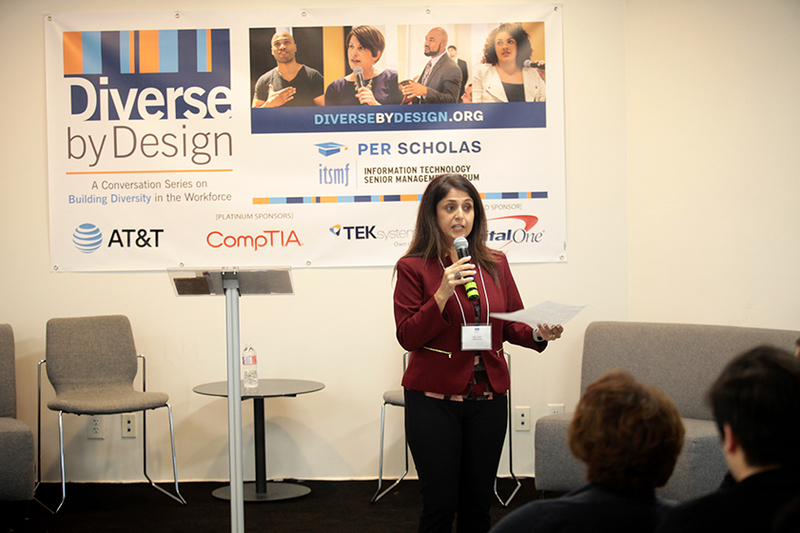 On Wednesday, October 24, 2018, Per Scholas and the Information Technology Senior Management Forum (ITSMF) hosted Diverse by Design Dallas, the sixth in a conversation series about building diversity and inclusion in the workforce. 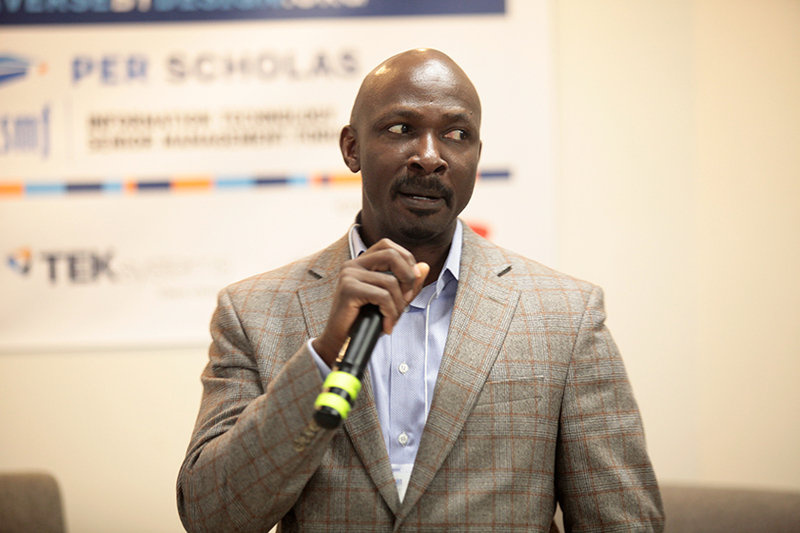 Over 100 leaders representing organizations across the tech, finance and nonprofit sectors gathered at the home of Per Scholas’ Dallas training site to promote diversity in the workplace. 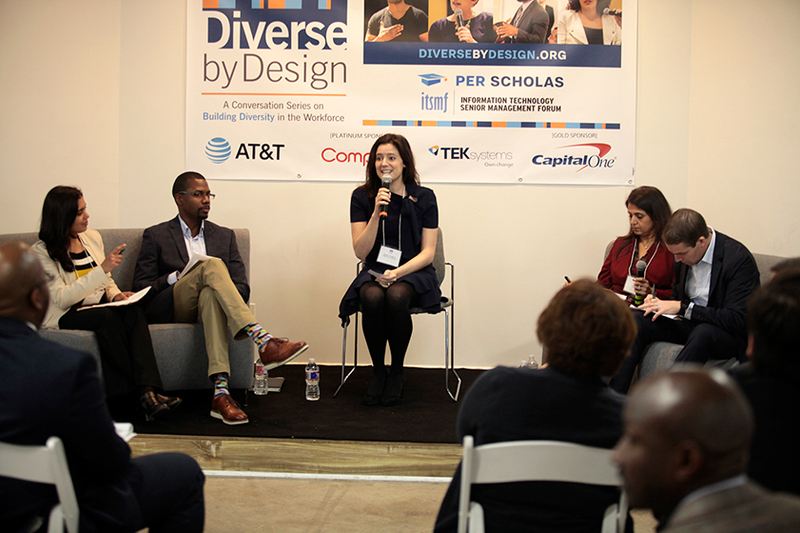 Speakers and panelists shared best practices in uncovering unconscious biases and tactics for C-suite leaders to identify, coach and retain diverse talent across all levels of their organizations. 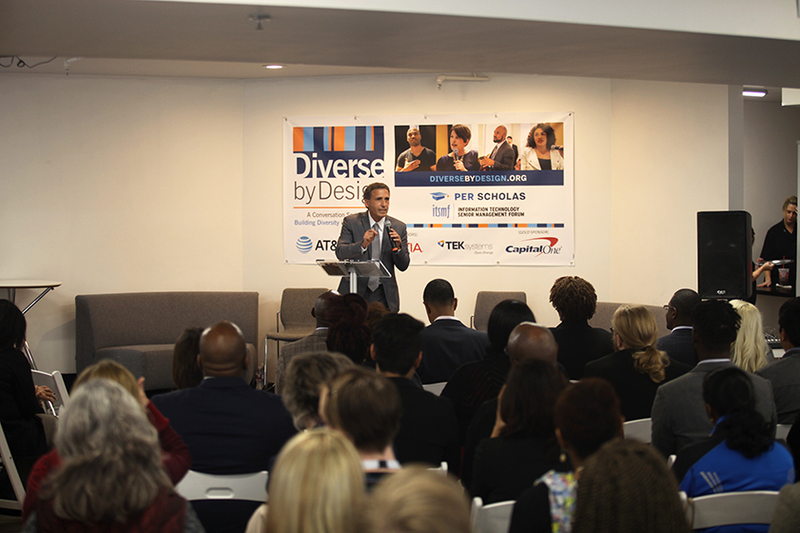 The afternoon was kicked off by Per Scholas President and CEO Plinio Ayala, who shared a story about Tara Fuller, a mother who recently graduated from Per Scholas and was able to secure a new job. Not only was this a testament to alternative hiring pipelines but also a great way to start an afternoon about Women in Tech off. Following Plinio’s remarks wasMontreece Smith, Board Chair of Per Scholas’ Dallas board of advisors. Montreece offered the audience of state of affairs in Dallas and spoke to her own experience sourcing and recruiting quality talent in the Dallas Fort Worth region. Faith Rottmann Johnson, Vice President, of Human Resources, at TEKsystems followed with an Ignite presentation. Faith has been in HR for over twenty years and shared a personal mission to support her companies growth and strategy to recruit, retain and promote women in technology. Congresswoman Eddie Bernice Johnson shared a historical perspective on the work she has pioneered in Texas for more than forty years. The Per Scholas Dallas location is centered in her voting district, and the Congresswoman commented on cross-sector effort needed to strengthen STEM education in primary, middle and high schools. The Congresswoman also called on men as allies for strengthening women’s careers. The congresswoman ended her remarks by drawing attention to “tech literacy” and how that needs to be reinforced for people in at-risk industries that may be overtaken by future advancements like automation. On stage representing one of Diverse by Designs’ Platinum level sponsors Corey Anthony of AT&T engaged in a fireside chat with Viola Maxwell Thompson of ITSMF. 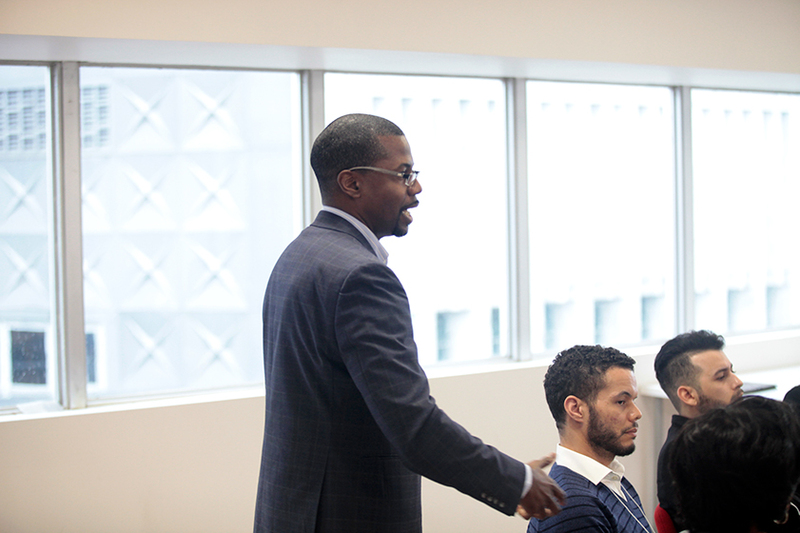 During his talk, he stressed the importance of being an effective manager and providing guidance to your team. Mr. Anthony also touched on the sentiments made by congresswomen Johnson by saying men need to be advocates in supporting women in the workplace. The role of education was also a big point of conversation for Mr. Anthony. He urged the audience to consider incorporating alternative talent pipelines in their hiring process. Programs like Per Scholas and even community colleges are some of the areas AT&T is looking into for new talent to hire or even bring into their internship program where students are given “real work” to help their development. This real work approach is extremely successful in getting the most out of their interns. It not only shows who has the drive to compete in real-world situations, but it increases production and development which ultimately leads to a promotion and full-time role within the organization. After the Session concluded Diverse by Design facilitators and attendees reconvened in the main hall for a report back to the entire group. Martin Fogelman, Co-Founder, and CEO of the app Pluto gave demos of his product which is a transparency & analytics platform for companies to leverage data to measure, discuss and improve their D&I efforts. The night capped off with Ty Bledsoe, AVP of external affairs at AT&T who announced a national 300K grant to Per Scholas on behalf of AT&T to support new training tracks and future technologists at several Per Scholas sites including Dallas.